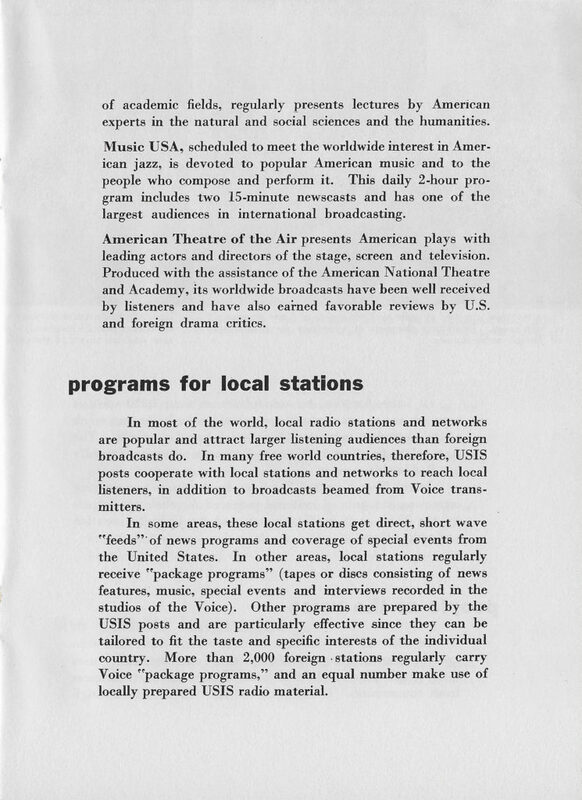 In 1959, the Voice of America (VOA) had a clear and convincing public relations message to describe its mission and to justify its $20 million budget 1 (approx. $168 million in today’s dollars) within the United States Information Agency (USIA). By comparison, VOA’s budget request for FY 2018 is $199 million within the Broadcasting Board of Governors (BBG) agency, more than it was at the height of the Cold War. A booklet published jointly by VOA and USIA in 1959 described Voice of America’s programs on behalf of the U.S. government and American taxpayers concisely with a strong presentation of mission purpose and evidence of effectiveness. 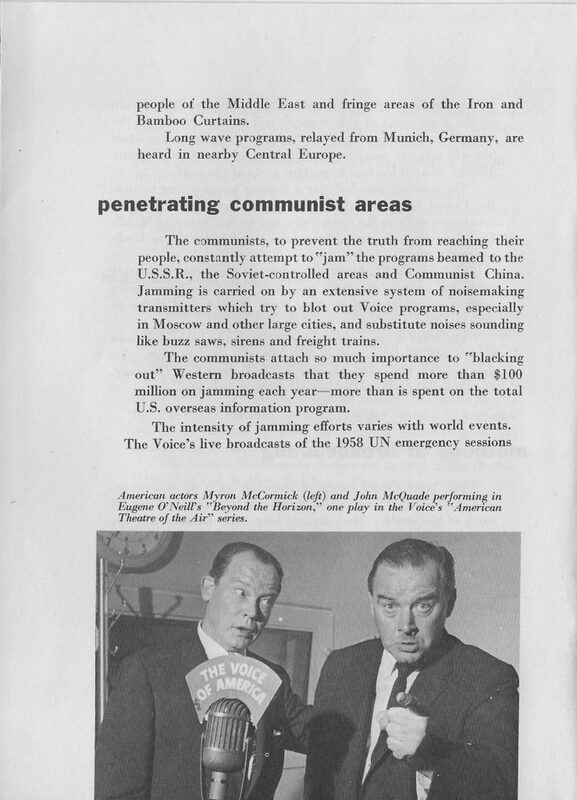 “In the continual effort to keep the record straight, broadcasts, when necessary, unmask and counter hostile attempts to frustrate and misrepresent the objectives and motives of the United States,” the VOA 1959 informational booklet pointed out. For a government public relations document, it provides a well-written and relatively honest accounting of VOA’s purpose and work during the Cold War. 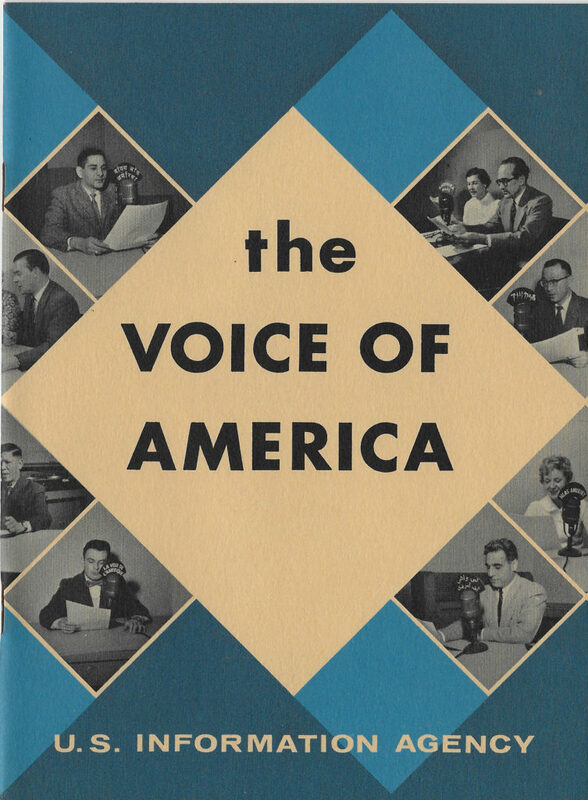 In 1959, the director of the Voice of America was Henry Loomis (April 19, 1919 – November 2, 2008). He was appointed VOA director in 1958 by President Dwight D. Eisenhower and resigned from the post in 1965 after policy conflicts with President Lyndon B. Johnson. He was later appointed by Richard Nixon (1972) to serve as president of the Corporation for Public Broadcasting. The director of USIA in 1959 was State Department diplomat Ambassador George Venable Allen (November 3, 1903 – July 11, 1970). The first broadcast (on February 24, 1942) was in the German language, penetrating the censorship screen established by the Nazi leaders. 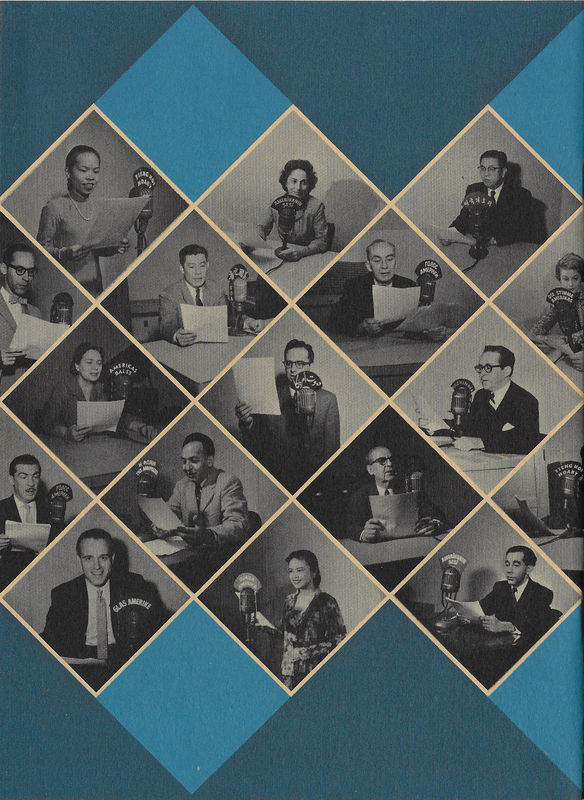 At the height of the war, the Voice was broadcasting more than 3,200 live programs weekly in about 40 languages. In the free world, the Voice programs complement the many and varied cultural and informational activities of 200 USIS* posts to give foreign audiences a complete picture of this country. *Agency offices overseas are known as USIS (United States Information Service). Voice of America broadcasts include straight, factual reporting of the news, with emphasis on matters of particular interest to the area where each program is heard. Important happenings in the United States, developments in the United Nations (reported by direct wire from UN headquarters), on-the-spot reports from international conferences, and news of all nations in the free world are included in the broadcasts. So are events in the Soviet Union, Red China and the Communist satellites. Behind-the-curtain listeners frequently learn the truth about economic developments and political changes in their own countries from Voice broadcasts, often before getting highly censored and slanted official announcements from their own Communist-controlled press and radio. and congressional spokesmen. In the continual effort to keep the record straight, broadcasts, when necessary, unmask and counter hostile attempts to frustrate and misrepresent the objectives and motives of the United States. 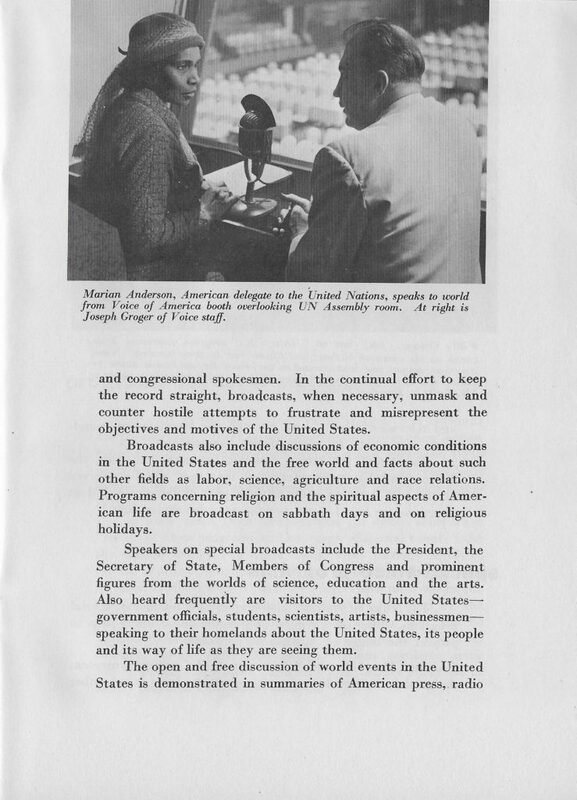 Broadcasts also include discussions of economic conditions in the United States and the free world and facts about such other fields as labor, science, agriculture and race relations. Programs concerning religion and the spiritual aspects of American life are broadcast on sabbath days and on religious holidays. Speakers on special broadcasts include the President, the Secretary of State, Members of Congress and prominent figures from the worlds of science, education and the arts. Also heard frequently are visitors to the United States–government officials, students, scientists, artists, businessmen–speaking to their homelands about the United States, its people and its way of life as they are seeing them. and television opinion, and through the broadcast of round- table discussions by distinguished personalities. To attract the largest possible listening audiences, the Voice schedules its broadcasts so that they will be received at the best listening hours in each part of the world. 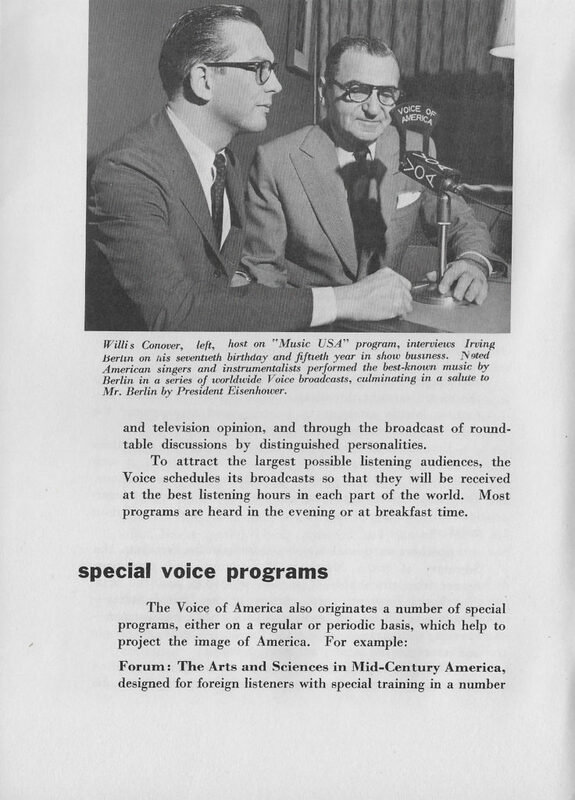 Most programs are heard in the evening or at breakfast time. ￼of academic fields, regularly presents lectures by American experts in the natural and social sciences and the humanities. Music USA, scheduled to meet the worldwide interest in American jazz, is devoted to popular American music and to the people who compose and perform it. This daily 2-hour program includes two 15-minute newscasts and has one of the largest audiences in international broadcasting. American Theatre of the Air presents American plays with leading actors and directors of the stage, screen and television. Produced with the assistance of the American National Theatre and Academy, its worldwide broadcasts have been well received by listeners and have also earned favorable reviews by U.S. and foreign drama critics. In most of the world, local radio stations and networks are popular and attract larger listening audiences than foreign broadcasts do. In many free world countries, therefore, USIS posts cooperate with local stations and networks to reach local listeners, in addition to broadcasts beamed from Voice transmitters. In some areas, these local stations get direct, short wave “feeds” of news programs and coverage of special events from the United States. In other areas, local stations regularly receive “package programs” (tapes or discs consisting of news features, music, special events and interviews recorded in the studios of the Voice). Other programs are prepared by the USIS posts and are particularly effective since they can be tailored to fit the taste and specific interests of the individual country. More than 2,000 foreign stations regularly carry Voice “package programs,” and an equal number make use of locally prepared USIS radio material. In Latin America, for example, more than 1,300 stations regularly use program material supplied by the Voice, and much of it is heard on many stations at peak broadcast times. The Agency’s radio effort for Western European countries is usually handled in this manner. In the Near East and Far East, local stations are carrying increasing amounts of material prepared for their special use by the Voice staff in Washington and by USIS information and radio officers. In view of the shortage of native-born Americans who know foreign languages perfectly, the Voice necessarily uses many people who were born abroad. Some of these are escapees from communism. Others came to the United States originally to study or to teach. Most have become or are in the process of becoming American citizens. 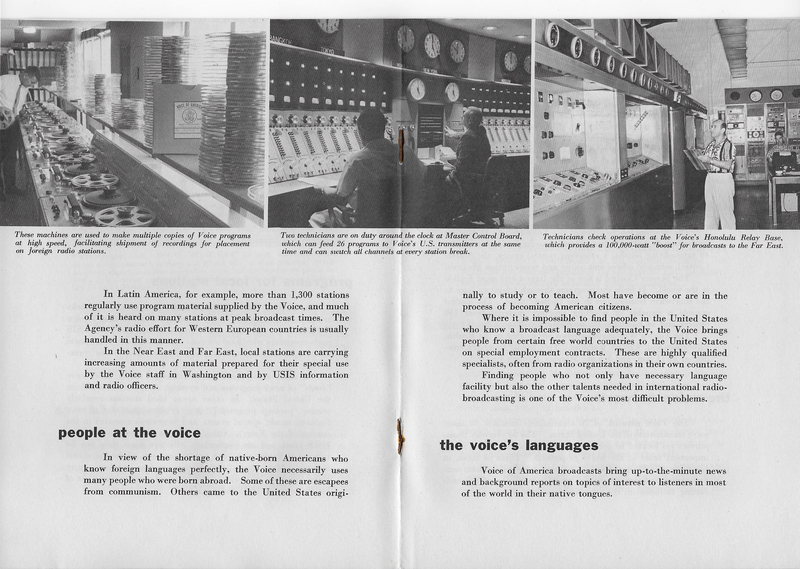 Where it is impossible to find people in the United States who know a broadcast language adequately, the Voice brings people from certain free world countries to the United States on special employment contracts. These are highly qualified specialists, often from radio organizations in their own countries. Finding people who not only have necessary language facility but also the other talents needed in international radio- broadcasting is one of the Voice’s most difficult problems. Voice of America broadcasts bring up-to-the-minute news and background reports on topics of interest to listeners in most of the world in their native tongues. ￼Increasingly, however, the Voice is emphasizing broadcasts in English, the most widely spoken international language. There is reason to believe that many find American news and policy reports more credible when they hear them in English–the language of the broadcaster. Direct short wave broadcasts are made daily in 37 languages, including English. Voice package programs are prepared in many other languages on a regular or periodic basis. The Washington facilities of the Voice include 18 studios, equipment to make 40 disc or tape recordings simultaneously, 10 tape-editing booths, a recording control center, the Master Control, editorial offices and music and transcription libraries. The Master Control is one of the largest and most flexible in the world. It feeds the programs through telephone lines to the shortwave transmitters in the United States. The control console is capable of selecting program material from 100 sources and of handling 26 programs simultaneously. The Voice’s Washington studios are located in the Health, Education and Welfare Building. Free public tours are conducted at 11 a.m. and 3 p.m., Monday through Friday. The Voice network of 76 transmitters includes 30 short wave transmitters in the United States. The 46 overseas trans- mitters are located to get maximum penetration into as many important areas of the world as possible. Three of them, in Germany, the Philippines and Okinawa, have million-watt output power and are among the world’s most powerful broadcasting facilities on the standard broadcast bands. ￼A modern, high-power transmitter plant now being built on the East coast of this country will not only increase the strength and clarity of the Voice’s signal to overseas relay bases but will make it possible in many instances to beam programs directly, if need be, into important areas of the world. The network also includes a floating broadcasting station, the United States Coast Guard Cutter Courier, now relaying broadcasts daily to the Soviet bloc and to the Near and Middle East from its anchorage off the Island of Rhodes in the Mediterranean Sea. 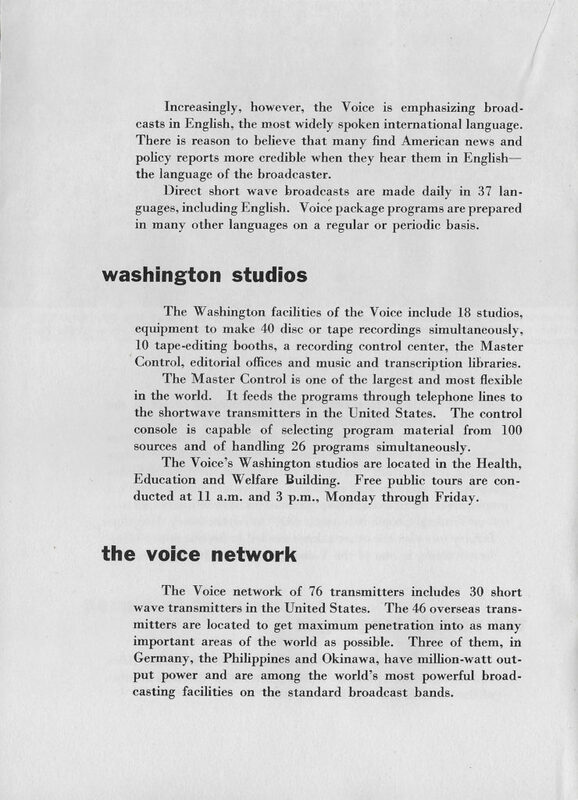 The Voice’s Washington headquarters are the originating point for most of the daily programs. Regional programing centers are maintained in New York, Munich and Cairo to provide special materials for Voice broadcasts. The USIS Berlin radio station RIAS (Radio in the American Sector) broadcasts continuously in the German language. Its programs are designed primarily for residents of East Germany, but they are also heard in nearby satellite countries. The Voice’s chief means of transmission is by shortwave, which carries over long distances and can be heard in almost all parts of the world. Medium and long wave broadcasting are also used, however, where transmitting facilities are located close enough to target areas and where the listening audience favors these types of broadcasts. 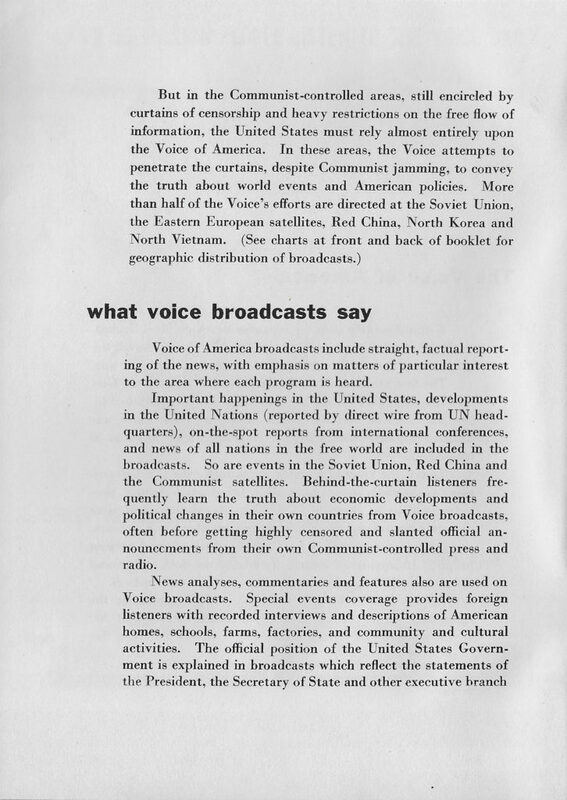 Voice programs go by short wave to the people in Communist countries, for example, because the broadcasts must be beamed a considerable distance and because much of the radio audience habitually listens to short wave radio. people of the Middle East and fringe areas of the Iron and Bamboo Curtains. Long wave programs, relayed from Munich, Germany, are heard in nearby Central Europe. The communists, to prevent the truth from reaching their people, constantly attempt to “jam” the programs beamed to the U.S.S.R., the Soviet-controlled areas and Communist China. Jamming is carried on by an extensive system of noisemaking transmitters which try to blot out Voice programs, especially in Moscow and other large cities, and substitute noises sounding like buzz saws, sirens and freight trains. The communists attach so much importance to “blacking out” Western broadcasts that they spend more than $100 million on jamming each year—more than is spent on the total U.S. overseas information program. on the Middle East were jammed on an unprecedented scale, even when they carried the remarks of the Soviet Foreign Minister. To minimize the effects of jamming, the Voice has reduced the number of broadcasts in the jammed languages and has greatly increased the number of transmitters on the remaining broadcasts. English, which is understood by growing numbers of people behind the curtains, is not normally jammed and is, therefore, another means of reaching these listeners. 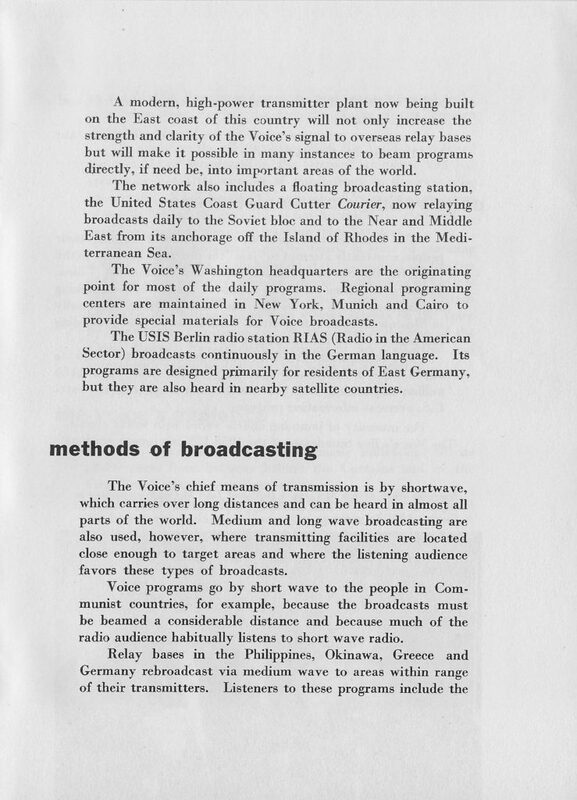 That many broadcasts can be heard in spite of jamming is clear from reports of monitoring stations located on the rim of Communist territory, from systematic questioning of visitors to and escapees from the Soviet orbit, from letters written by Soviet bloc listeners, and from violent attacks on the Voice by Communist dignitaries and by the press and radio of the Soviet Union. Nevertheless, jamming is very effective and represents a major problem for the Voice of America. 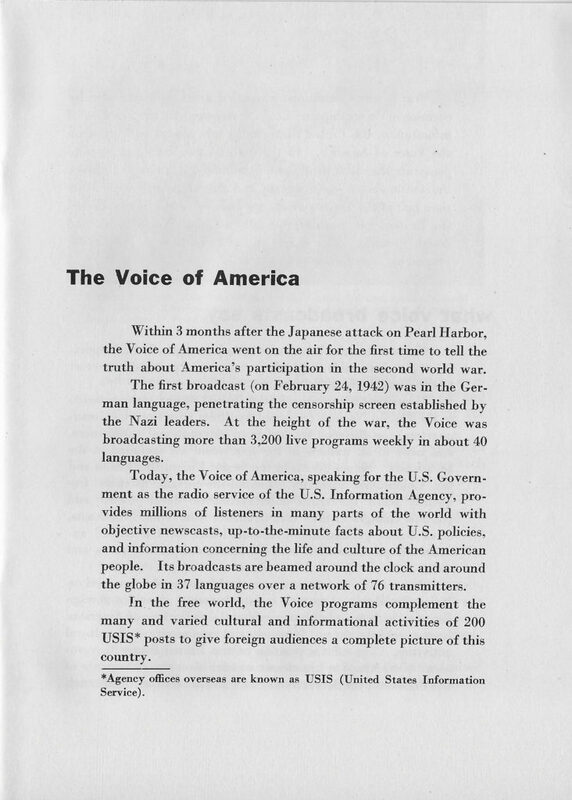 Three-fourths of the hundreds of persons who escaped to the free world during the Hungarian uprising of 1956 said that they had listened to the Voice of America. As part of a recent series of broadcasts on life in the United States, the Voice carried an interview with a former Rumanian resident, now living in Cleveland, Ohio. 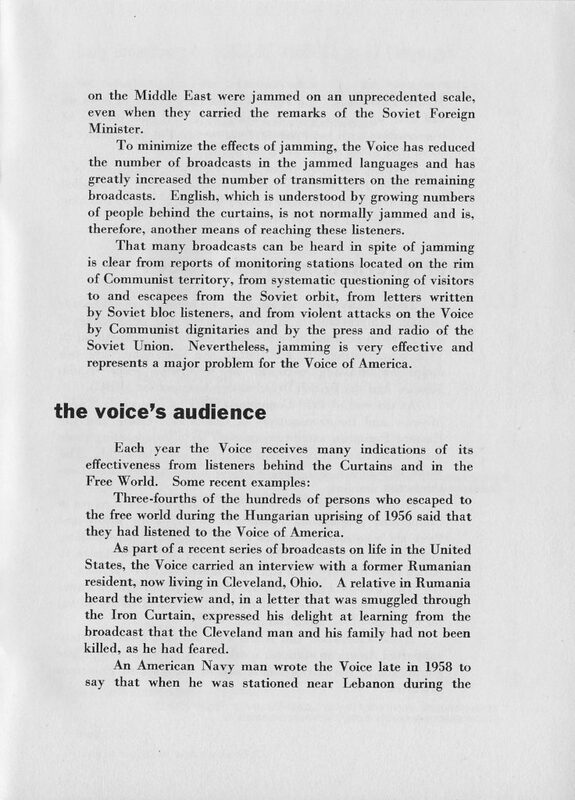 A relative in Rumania heard the interview and, in a letter that was smuggled through the Iron Curtain, expressed his delight at learning from the broadcast that the Cleveland man and his family had not been killed, as he had feared. Today many countries are engaging in international broadcasting. 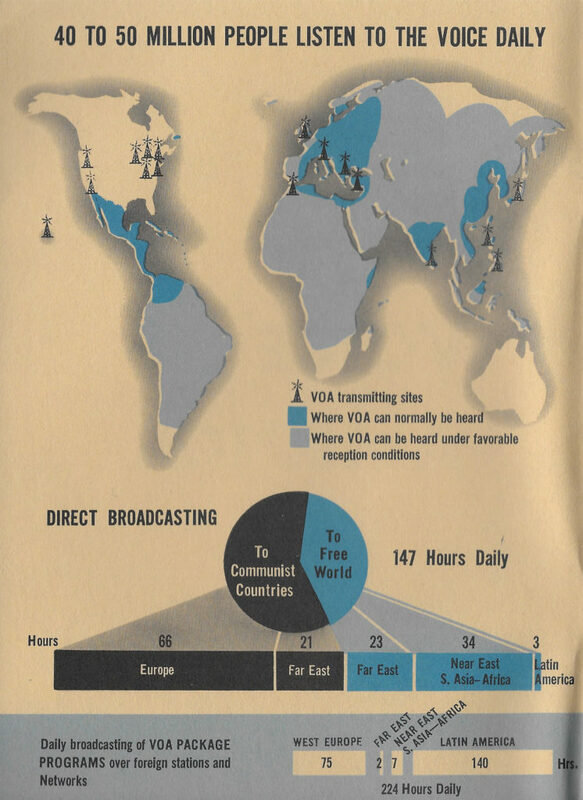 Improvements in both facihties and programing of foreign radio stations have provided increasing competition to VOA broadcasting. In addition to the Voice, there are two major broadcasting networks of worldwide scope—Radio Moscow and the British Broadcasting Corporation (BBC). 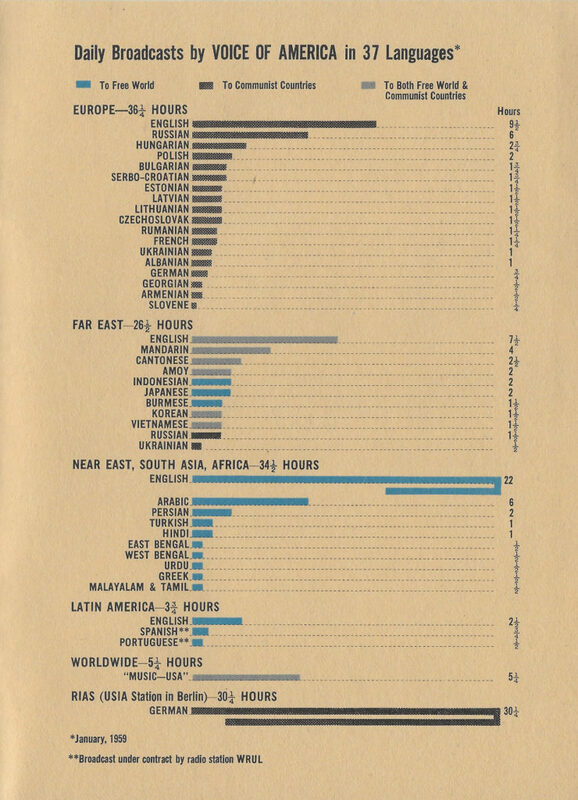 At the end of 1958 Communist stations (especially Radio Moscow and the transmitters of Communist China and the Eastern European satellite countries) were broadcasting more than 350 hours a day in many languages around the world. The Voice of America and BBC were broadcasting less than two- thirds this amount. 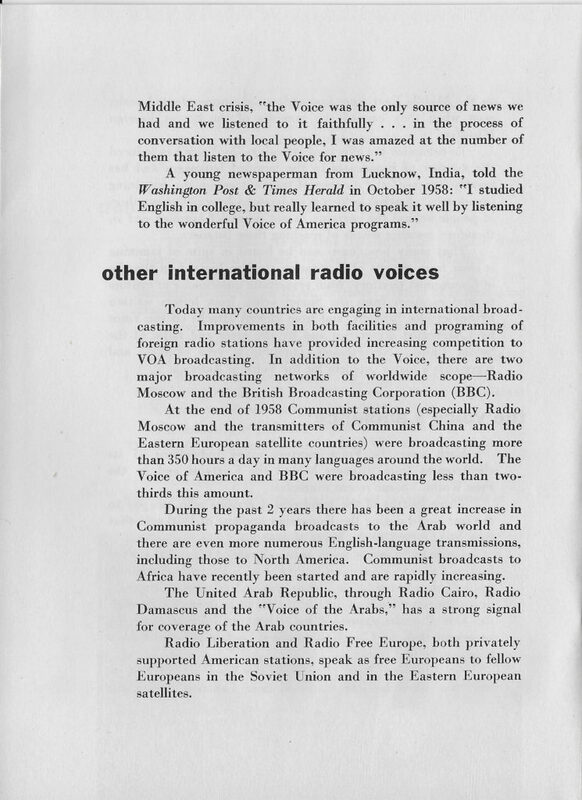 During the past 2 years there has been a great increase in Communist propaganda broadcasts to the Arab world and there are even more numerous English-language transmissions, including those to North America. Communist broadcasts to Africa have recently been started and are rapidly increasing. The United Arab Republic, through Radio Cairo, Radio Damascus and the “Voice of the Arabs,” has a strong signal for coverage of the Arab countries. Radio Liberation and Radio Free Europe, both privately supported American stations, speak as free Europeans to fellow Europeans in the Soviet Union and in the Eastern European satellites.